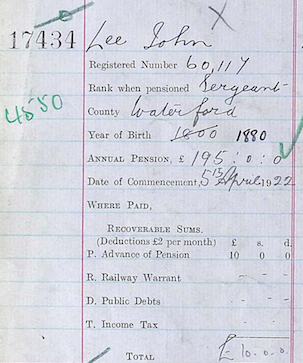 John Lee was a member of the RIC stationed in Ardmore in the 1910s - he is listed in the 1911 census and lived on Main Street with his wife, Hannah & son David, in the house of the current post office. John was Church of Ireland, from west Cork. A constable in 1911 he retired as a sergeant in Waterford in 1922. His pension payments in 1922 were made in the village of Baldock, Hertfordshire.